On behalf of ProSiebenSat.1 Games, we're delighted to announce the tenth expansion for Everquest II - in its tenth anniversary year. You can download the full press release and screenshots from here, a making of video from here, or watch the video / grab embed codes from YouTube here. You can also watch or grab embed codes for the launch trailer here. The original trailer file will be on the FTP site (scroll down for details) later today. Munich/San Diego – November 13th, 2013 – Sony Online Entertainment, LLC (SOE) and ProSiebenSat.1 Games today announced the launch of EverQuest®II: Tears of Veeshan™, the 10th expansion for the hit massively multiplayer online role-playing game (MMORPG). The Tears of Veeshan expansion features engaging new content, including a compelling storyline to experience, a new overland realm to explore, massive dungeons, dragon-themed Alternative Advancements (AAs), the new Channeler class, and a host of challenging quests and items. EverQuest II: Tears of Veeshan is set amongst the Eternal Broodlands, resting place of the dragon dead. Here, players will rediscover familiar fallen dragons, including Yelinak (now the keeper of the Vesspyr Isles), and learn of Kerafyrm the Awakened’s quest to rule all. Using his stolen Tear of Veeshan, Kerafyrm’s fearsome power now threatens Norrath. Players are called upon to fight the Awakened’s draconic army, shine light into the world’s looming darkness, and set the tone for a new Age’s beginning. Overland Dragon Realm – Venture through Vesspyr, the Eternal Broodlands, while seeking quests, collections, and more! Variety of Quests – Signature, story, tradeskill, point-of-interest and dropped quests, missions and collections. 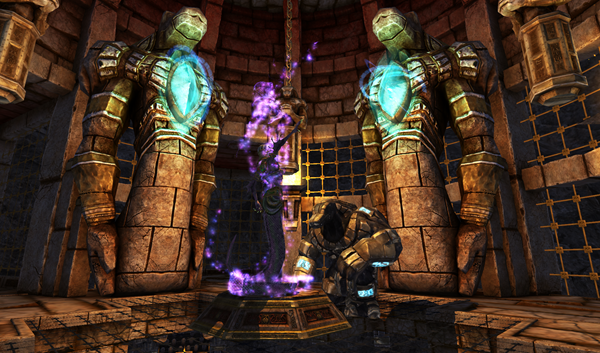 New Dungeons (9) – Experience unique local stories across new dungeons, including Temple of Veeshan (3), High Keep (2), Nexus Core, Chamber of Stasis, Stratum of the Protectors, and the Fractured Hive. Dragon-Themed Alternate Advancements (AAs) – A new line of AAs (healer, warrior, mage, and scout) dedicated to iconic dragons. New Channeler Class – Wield your bow while taking advantage of this new Priest class’s “dissonance” energy, intercept healing mechanics, and Construct pets. Additional Features and Content – New itemization focused on flexibility and play style choices, AA limit raised to 340, tradeskill apprentice items, and a new PvP item tier. EverQuest II: Tears of Veeshan is rated T for Teen by the ESRB with the content descriptors for suggestive themes and the use of alcohol and violence. Tears of Veeshan is available for €40. The Collector’s Edition, which includes several in-game bonus items, is available for €85. EverQuest II is a Free to Play. Your Way™ title for PC systems via digital download in Europe via ProSiebenSat.1Games. For more information on Tears of Veeshan, please visit our website. EverQuest II is the epitome of massively multiplayer gaming, a huge online world that blends deep features, heritage, and community. Featuring breathtaking graphics and a vast, beautiful game world to explore, EverQuest II sets the standard for graphical realism as players are immersed in the game’s exciting locales, mysterious lands, intense battles, exciting quests, and amazing achievements. EverQuest II features a powerful epic storyline and gives players the power to be the hero or villain in their personal adventure. Players enter this world by creating their own unique character, choosing from 20 races and 26 classes. Players will encounter thousands of creatures as they travel across a majestic landscape of enchanted forests, deadly volcanic plains, rolling hills, and bustling cities. Thousands of items, hundreds of spells, and unlimited adventure await all who enter the world of EverQuest II. The games publisher ProSiebenSat.1 Games is a subsidiary of the ProSiebenSat.1 Group focusing on the licensing and marketing of online and mobile games, as well as the acquisition of games partners throughout Europe. The company's portfolio includes, among others, S4 League, Maestia and Florensia as well as Europe-wide licenses to several games from Sony Online Entertainment, including DC Universe™ Online, EverQuest® II, PlanetSide® 2, Wizardry Online®, and the sequel to the EverQuest® franchise. Sony Online Entertainment LLC (SOE) is a recognized worldwide leader in massively multiplayer online games. Best known for its blockbuster hits and franchises, including EverQuest®, EverQuest® II, Champions of Norrath®, PlanetSide®, Free Realms®, Star Wars®: Clone Wars Adventures™, DC Universe™ Online, and PlanetSide®2, SOE creates, develops and provides compelling online entertainment for a variety of platforms. SOE is building on its proven legacy and pioneering the future of online worlds through creative development and inspired gameplay design for audiences of all ages. To learn more, visit www.soe.com. SOE, the SOE logo, Free to Play. Your Way™, EverQuest, Champions of Norrath, PlanetSide, and Free Realms are registered trademarks of Sony Online Entertainment LLC. All other trademarks and trade names are properties of their respective owners.